Late summer, late morning. Peaches are ripe. A soft bite of ripe peach might be my favorite bite of food all year. Danny toasted almonds last night. There’s honey from a farmer on the island in the cupboard. And earlier this morning, I made fresh ricotta. Breakfast is especially delicious today. When I was asked by the Washington State Dairy board to visit the Werkhoven family farm, I was also asked to create a recipe using dairy for this site. (I was compensated for both posts.) That’s not hard around here. Danny and Lucy are lactose intolerant but they can both still eat cheese, butter, and yogurt. Good whole-milk yogurt for breakfast, with toasted nuts, fresh fruit, and homemade granola happens at breakfast around here pretty often. However, lately I’ve been enjoying fresh ricotta instead. I was inspired by a recipe in our friend Heidi Swanson’s new book, Near and Far. She uses good ricotta as the base, then adds banana, dried fruit, honey, and flower pepper. I use whatever we have on hand, with 1/3 cup of the ricotta I made earlier in the day, to eat a deeply satisfying breakfast. Think the mouthfeel of ice cream without the sugar. I made the ricotta pictured above with milk and cream from a small dairy on Vashon. The cream was a rich, golden yellow, so the ricotta came out sunnier than normal. I recommend you make ricotta with milk and cream that have been only lightly pasteurized, as the ultra-pasteurized dairy won’t form curds as easily. That means seeking out a local dairy is worth the effort. What to do with the leftover ricotta? Lasagna, of course. Make lasagna. Later, after I ate this breakfast, I combined the rest of my ricotta with 2 eggs, handfuls of chopped fresh herbs, the tomato juices left over from the tomato salad we had made for the dinner the night before, and some salt. I baked it in a greased pie pan for 20 minutes or so at 350° for a baked ricotta cheese dip that disappeared quickly on our table. Ricotta’s a great spread on good bread, toasted. Also, be sure to save the whey when you make ricotta. (That’s the liquid that drains out when you keep the curds in a cheesecloth-lined colander.) Use whey in place of the water in your favorite gluten-free bread recipe for the best bread you’ve made in awhile. As much as I like yogurt, I think I’m done with that for breakfast for awhile. 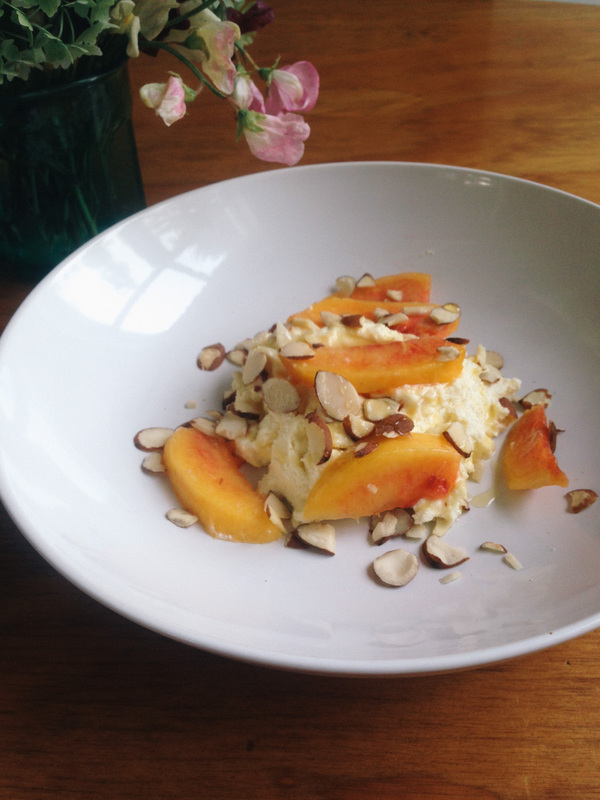 Ricotta bowl with peaches and almonds for breakfast this morning too. Prepare to make the cheese. First of all, line a colander with several layers of cheesecloth. (And if, as is sometimes true here, you have run out of cheesecloth, lay many layers of paper towels over each other in a colander.) Put the colander over a large bowl or pot. Simmer the milk and cream. Set a Dutch oven or other large pot over medium heat on the stove. Pour in the milk, cream, and salt. Cook, stirring occasionally at first then more often as the milk and cream heat up, to prevent the milk and cream from scorching. After about 8 to 12 minutes, the milk and cream should be starting to steam. Small bubbles should be forming along the edges. At this point, stir in the lemon juice. Stir and stir, gently, until curds begin to form. (It looks like the milk and cream are clumping up in the middle of the pot.) This should take 1 or 2 minutes. Stir gently, very occasionally, letting more curds form, for a few moments. If you don’t see curds forming, squeeze in a little more lemon juice. Drain the ricotta. At this point, you could scoop out the curds. However, I usually turn off the heat and set the pot on the back of the stove and let the milk and cream sit for 10 to 15 minutes. It seems to solidify the curds a bit more. At the point, slowly so slowly pour the mixture into the prepared colander. Stop once in a while if the liquid rises too high. The leftover liquid (whey) will drain into the bowl below. You will be left with warm cheese curds. Form the cheese. Move the cheesecloth around, gently, to squeeze some of the why out of the curds. (Don’t do this too vigorously.) Form a ball with the cheese curds. After 10 minutes or so, move the cheesecloth ball to a bowl. Put the ricotta in the bowl. At this point, you should spoon the warm ricotta onto a piece of good bread. Or, you could refrigerate to tighten the ricotta. The longer the ricotta is in the refrigerator, the more it will tighten up. I like to make this breakfast bowl with ricotta that has just reached refrigerated temperature. Save the whey! It’s great for bread making, in particular. Makes 1 1/2 cups ricotta cheese. That looks amazing! I need to get some fresh peaches. I had no idea cheese like this could be made at home! Question: in the step titled ‘simmer the milk and cream’ you said to stir the mixture ‘very occasionally.’ I am new to complex recipes, and gluten free recipes specifically, so I’ve never read this directive. Can you clarify how often the stirring is needed? Oh, you’ll know! You want to stir just enough to prevent burning. But vigorous stirring would prevent the curds from forming. Looks great! Recently I have cravings for light meals, salads, yoghurts and so on, so this will be the perfect dessert for Friday evening – just a little something to start you weekend.